Making compost is pretty straight forward. Anything that once grew in the ground can be used. Cool climate tropical gardening presents you with two periods with high volumes to compost. One in late winter during the cut back and tidy up phase. The other just prior to and just after the first frosts. The periods in between consist mainly of dribs and drabs of kitchen scraps, lawn mowing's and small scale garden waste. The production of garden compost is generally achieved through one of two processes. High temperatures kill weed seeds, most plant diseases, and perennial weed roots. 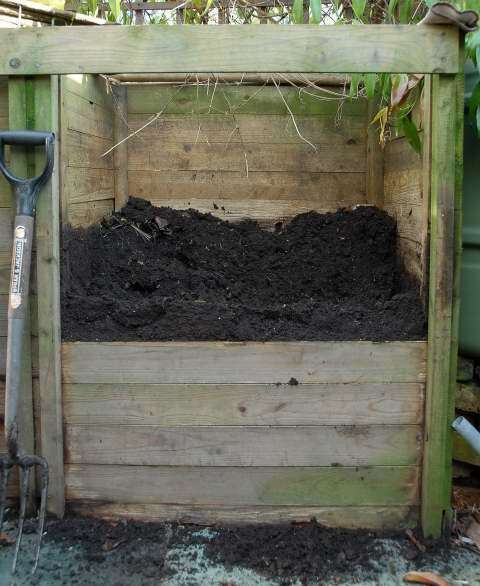 However in order to produce compost by this method you need a lot of stuff to begin with. It requires regular turning, preferably by some sort of machine like a JCB skid steer loader. Plus you need lots of space! None of these conditions are commonly met in the domestic garden scenario. Compost tumblers can be used in the domestic setting to produce compost quickly. They are large pieces of equipment suitable only for people with a lot of spare space in their gardens. They are basically a large cylindrical drum mounted on a couple of legs. The drum has a handle. When cranked regularly, the rotting material is kept well aerated and speeds up the process. In the domestic setting though, what's the rush? As hot composting is not that relevant to your typical garden we shall move swiftly to something that is. This method of producing garden compost is the most common. Cool composting is the regular addition of compostable material to some form of compost bin. There will be occasions when a large volume of material is collected and some heat is generated but largely the cool compost heap decays slowly with the help of various bacteria and creatures, in particular, worms. There is no need to purchase any worms or activators, it all just happens on its own. My own illustrated compost making regime is described in full here. In order to make good compost there is a small list of requirements. The best compost bin set up is to have a system with two bins. One for adding to and one for maturing. Whatever the size of your garden you should try to have two bins. If your garden is small, have two small bins. Having two bins means never having to separate mature compost from semi-rotten yuk. Growing tropical plants creates a lot of matter. The larger your compost bins the easier it is for you. If you are serious about making compost a garden shredder is a valuable tool. For the typical urban garden an electric powered shredder will be sufficient. If you have a sprawling estate, more powerful petrol versions are available. The benefit of using a garden shredder is to increase the surface area of what you wish to decompose. The more surface area the faster the process. If you put a thick branch straight into the compost bin it will still be there in a years time. Shred it and it becomes incorporated with everything else. There are basically two types of electric garden shredders. Impact shredders - these have a spinning blade rather like a food processor. They are cheaper but noisier. These work better with greener material. Blades will get blunt over time which reduces the efficiency. Replacing blades is a headache unless you enjoy working with spanners and the like. Crush and cut shredders - these shredders pull the material into the shredder for you and then a blade chops it in to small pieces. Much quieter but more expensive due to more moving parts. These shredders cut quite coarsely and it is worth re-feeding the stuff through for a second time if it is very woody. There is a tendency for them to get clogged if you try to put too much green material through. The best solution is to leave any green pruned material in a neat pile for a few days. The remaining leaves will remove water from the material and then will be drawn into the shredder much easier. Crush and cut shredders work best with branches and twigs. In an ideal world it would be nice to have one of each. If for whatever reasons you decide against a shredder, twigs and the like should still be chopped into small pieces using secateurs. Apart from increasing the surface area for decomposition, a lack of twigs will make your job of turning the compost that much easier. Leaf mould is the process of composting leaves separately.